Posted on Thu, Jan 19, 2012 : 8 a.m.
Jean Stapleton, who was so beloved as Edith Bunker on "All in the Family," is celebrating her 88th birthday today. 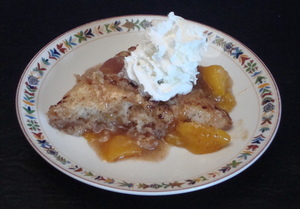 In her honor, I'm offering a recipe that uses peaches... cling peaches, specifically. Cling peaches in heavy syrup. Some of you are just reading along, waiting to see what Jean Stapleton and cling peaches have in common with each other. Others of you, though, are showing your age (just as I am!) and your good memories. You're humming along, saying "mmm MMMmmm." Now, of course, you understand that I had to honor Edith's integrity and Jean's comedic talent today by showcasing the mmm MMMmmms! Edith wasn't a sophisticated woman at all, though she had a heart of the purest gold; what she lacked in education and intellect, she more than offered in genuine kindness. A simple dessert seemed fitting, then — the kind of treat Edith might enjoy with a neighbor while chatting and sipping coffee as they took a break from their household chores. And then I had an epiphany: I looked to see if there might be a celebrity cookbook, or one "written" by the fictional character that could offer a recipe... et, voila! I found that there is, indeed, an "All in the Family" Cookbook and it contains a recipe for Peach Pudding Cake! Since I don't have the actual book though, unfortunately, I had to finagle my own version. Pudding cakes are very easy to make, and usually involve mixing dry ingredients in a baking pan and then pouring hot liquid over them; while baking, a layer of cake and a layer of pudding are then formed. This turned out to be sweet and spicy — a lovely treat. But I think my very dear friend Rob and I are the only ones who remember this episode. Rob teaches a regular "Lunch and Learn" class each week, and each spring he offers them as "Lunch and Laugh" sessions to focus on humor of all varieties. One time, he was going to discuss integrity and honesty by using Edith's shining example as an illustration. He and I chuckled, remembering the scene with such fondness — it was so funny! We were sure the class would be a huge hit. And yet, he came back a bit disillusioned afterwards. Many people in attendance — retirees, primarily, who were definitely old enough to have seen the cling peaches hilarity when it actually aired — didn't remember the episode, or they only remembered it vaguely. They laughed while watching the video in class, and they enjoyed discussing it. But, c'mon! They should have known it as well as Rob and I did! So today, in Jean's honor, I'm making sure that this classic scene isn't forgotten. And every time you see a can of this fruit from now on, remember that they're not "cling peaches" — they're "mmm MMMmmm ... in heavy syrup." Preheat oven to 350. Grease a 9-inch pie pan. Drain the peaches and reserve the syrup. Chop the peaches into 3/4-inch pieces and place into the bottom of the prepared pie pan. Measure the syrup; add water to make 3/4 cup liquid. Pour the syrup into a small saucepan and add the brown sugar, cinnamon, butter, and 1 teaspoon vanilla; bring to a boil, stir to combine, then remove from heat. In a large bowl, combine the flour, sugar, baking powder and salt. Combine the buttermilk and remaining 1 teaspoon vanilla; pour into the flour mixture and stir to combine well. Pour the cake batter over the peaches and spread to cover the peaches as much as possible. Pour the syrup over the cake and bake for 30-35 minutes until a toothpick inserted into the center comes out clean and the peach sauce is bubbling. Let cake rest for 5 minutes, then serve. Top with whipped cream or ice cream, if desired. Mary Bilyeu writes about her adventures in the kitchen - making dinner, celebrating holidays, entering cooking contests ... whatever strikes her fancy. She is also on a mission to find great deals for her Frugal Floozie Friday posts, seeking fabulous food at restaurants on the limited budget of only $5 per person. Feel free to email her with questions or comments or suggestions: yentamary@gmail.com. You should also visit Mary's blog — Food Floozie — on which she enthuses and effuses over all things food-related. The phrase "You Should Only Be Happy" (written in Hebrew on the stone pictured in this post) comes from Deuteronomy 16:15 and is a wish for all her readers - when you come to visit here, may you always be happy. Fri, Jan 20, 2012 : 1:36 a.m. I loved the way you kept everything fresh and local, with the canned peaches and canned whipped cream. Yummy!! Fri, Jan 20, 2012 : 5:07 a.m.
Thu, Jan 19, 2012 : 6:21 p.m.
Thu, Jan 19, 2012 : 6:27 p.m.